Painting by the famous artist V. I. Surikov “Morning Streltsy Penalty” is a recognized masterpiece of the author, written in the genre of historical painting. 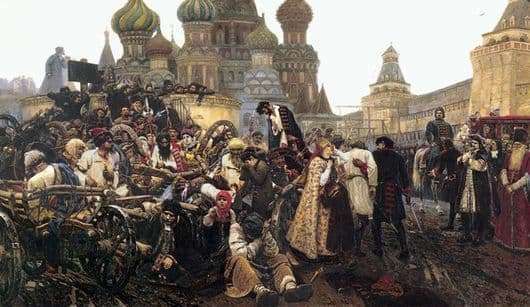 The picture tells about the terrible and bloody event in the history of our country: about the punishment of Tsar Peter over the archers, which formed the basis of military units of that time, the massacre because the archers supported in the struggle for power sister of Peter on the father – Princess Sophia. In this case, the artist does not show his viewers scenes of massacre, but seeks to tell about the state of mind of his characters in this terrible moment. In the center of the composition are the figures of the archers themselves and their loved ones. Everyone here behaves differently. A young woman in rich clothes wringing her hands from grief and hopelessness, a child – a boy of five years old – buried in her clothes. An old woman in impotence fell to the ground, next to her was a girl of about four in a red scarf screaming something unintelligible. Another young woman covered her face with her hands. One of the archers fell into despair and hung his head, the other – a gray-haired old man – looks at others with a unseeing glance and cannot believe the reality of what is happening. The archer’s face with a black long beard is full of internal tension, he gathered all his strength of will to survive the coming execution with honor. And only a red-haired archer in a red hat with hatred looks towards the young king. Peter himself, pictured aside, is also tense. He sits on a horse, as if towering over what is happening and watching his soldiers and officers prepare those sentenced to death. However, his eyes look with fierce strength and tension. He is also full of hatred for archers, but this hatred is complemented by an awareness of his power in this difficult moment. The picture faced the old and the new Russia, and one must be destroyed so that the second could gain strength, and this is Russia of Peter, the great and terrible Russian reformer tsar.